The LifePack was designed as a cost effective way to prepare for an emergency. It produces a 3 day supply of drink from virtually any water source, even muddy water. 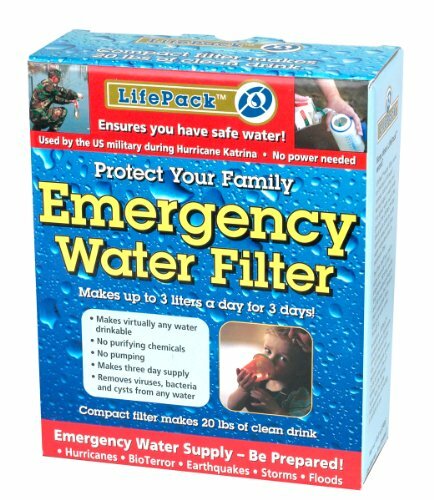 Stock up today and prepare your family for an emergency. The filter uses a passive osmotic process so it never clogs, requires no pumping and filters down to the atomic level (3-5 angstroms - which is .3-.5 billionths of a meter) so the filter removes even the smallest viruses to the same purity of a complicated reverse osmosis machine. Forward osmosis filter requires no pumping, works in any virtually and water, even muddy water. Produces a sports drink for improved hydration. The highest purity level of any personal filter, non-clogging filter produces a sports drink for improved hydration.